Ever feel like all the VBA examples are way simpler than the code you face in real life? A post with simple code is good for explaining a topic clearly. It can make things much easier to understand. But the real world is more complex. The code you meet can often look like it was fed through the Enigma machine first. If you understand the ideas presented here it will dramatically improve you skills when you deal with real world VBA code. 4 Oh No, My Brain is Bursting! The underscore character “_” is used to break up long lines of code in VBA. The code behaves exactly the same as if it was on one line. It’s just easier to read. To view the Immediate Window select View->Immediate Window from the menu or press Ctrl + G.
If you are new to VBA you may want to get familiar with VBA Cells and Ranges first. For more info on the Loops used here, go to For Loops and For Each Loops. If you are familiar with VBA you will have seen code like this a lot. If you are new to VBA then this code can seem daunting. What do the numbers mean? What are the calculations for? What does it all mean? These are some of the questions you may have. I’m going to answer these questions. Then I’m going to break the code down in the simplest terms possible. I’m going to explain each part in plain English. 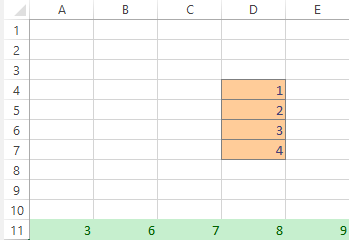 The code on the right of the equals is adding the value of two cells. The cell to the left of the equals receives this value. This left side of the line uses the Cells property to place a value in a cell. The variables x and j are each used in with a for loop. So next we will look at how the x and j are used. I am going to show you how the values change as the code runs through the For Loop. If you are not familiar with loops then you may want to read about the For Loop first. If you would like to see a simple example of a loop in action then check out the section How a Loop Works. What a For loop does is to repeat a line of code a given number of times. In the above code it will repeat the lines between For and Next four times. That is the values from 1 to 4. The original code has two loops so let’s look at the second For loop. The reason we have two for loops is because we are dealing with rows and columns. The outer loop (for x) reads through rows and the inner loop(for j) reads through the columns. The For x loop runs 4 times. Each time it runs the For j loop runs 5 times. The first time it runs the For x loop sets x to 1. Then the For j loop sets j to 1. Cells(x + collect, 4 + j) will be Cells(1 + 3, 4 + 1) which gives Cells(4, 5) which is cell E4. Cells(x + collect, 4 + j) will be Cells(1 + 3, 4 + 2) which gives Cells(4, 6) which is cell F4. The Cells code will be repeated 20 times. The For loop x runs 4 times. Each time it runs the For j loop runs 5 times. The table below shows the values for Cells, row and column for the first 8 times. When the code runs, all these cells are assigned a new value. This value is got from the code to the right of the equals. Let’s look at this next. Let’s have a look at the code to the right of the equals. The result of this calculation will appear in the cells we have shown. The difference is that it refers to the cell one column to the left. The variable inptr is set to 11 at the start of the Sub. It never changes. So this cell is always in row 11. The column we use here takes the value j.
Oh No, My Brain is Bursting! Well done on reaching this far. It shows you are serious about learning VBA. Your brain may be hurting but don’t worry. The worst is over. The rest of this post is much simpler. So sit back and relax as I rewrite the code and make it easier to read. Let’s take the original code again. We’re going to make to change it piece by piece until it is a thing of beauty! Then we don’t need to calculate the row each time. x is already the correct row. Let’s create some variables to define our range. We’ll give them names that mean something. Now we have all the cells positions. We can create the For loops to read through these cells. No calculations needed to find the cells. Note: It is standard to use i and j as variables in For loops. Let’s look at the main line next. It is now much simpler. See the original and new versions below. So you can see the code is much more readable. We only have one calculation for a cell and that is subtracting 1 from j. The last part is a little bit tricky. We know the row with the values is always 11 so let’s rename the variable Inptr to rowValues. The value in A11 is added to E4, B11 is added to F4 and so on. So for the first value we add from column 1, the second value from column 2 etc. We place this counter before the second loop. This means it starts at one each time the For j loop runs. We then a line to the loop that adds one to it each time so it moves on one column. You can see this code is much more readable. The variable names give a clear indication of what the values are. There are no complicated calculations. This makes code easier to read or change. It is also less likely to have errors. For completeness I’m going to show another way you could perform the same task. Let’s write a version of this using the For Each loop. The major difference this time, is that we only need one loop. Dim sRange As String: sRange = "E4:I7"
Now we want to set the value of the cell to something. The first part of the calculation is the cell to the left. We can use the Offset property of range. If the rCell here was E4 then rCell.Offset(0, -1) would be D4.
' 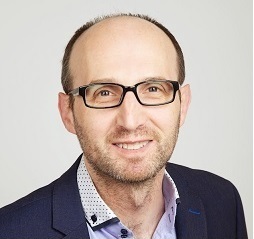 A count to the column on the values row. You can see we have broken down the calculation into two lines. This makes the code easier to read and understand. We also only have one For loop which means we have not complex calculations to figure out. If you have read this far then congratulations! This was not a simple topic. 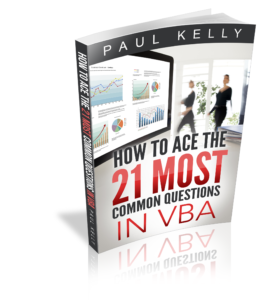 If you can grasp the ideas then you are well on the way to becoming proficient at VBA. If you come face to face with complex code you can approach it like this. Break it down into simple parts. Try to understand what each part is doing. Then, values at row 11 could be in any row of your sheet and you avoid using constant values (11) in your code.